"People have been dying on farms." 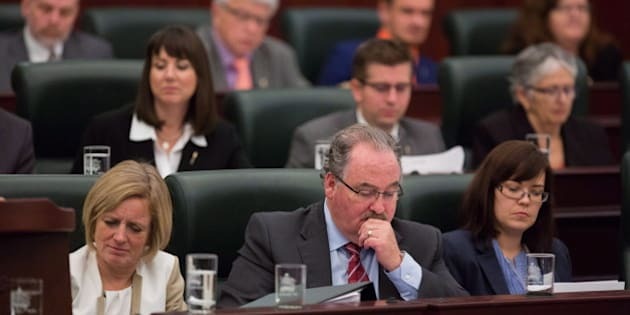 EDMONTON — One of the most turbulent Alberta legislature sittings in recent memory wrapped up Thursday with the passage of a contentious farm-safety bill. The NDP government passed the bill in third reading by using its legislative prerogative to cut off debate. Prior to the bill passing, house leader Brian Mason said there had been 20 hours of debate at the second reading alone and he suggested the opposition was just trying to stall. Mason said the crux of the bill was to provide to farm workers basic rights that workers in other industries have. The rules will only apply to farms where there are paid workers. "People have been dying on farms. People are injured on farms,'' Mason told the house. "It may be less than (in) some other places, (but) that doesn't matter. Those lives are worthwhile. Those lives are valuable. Opposition parties fought hard against the Enhanced Protection for Farm and Ranch Workers Act. They said it needed more consultation with those affected. An opposition motion to refer the bill to a committee was rejected by the NDP on Wednesday. Once proclaimed, the new legislation puts paid farm workers under new rules starting Jan. 1. They will be eligible for workers' compensation benefits if injured on the job. Farms will also come under occupational health and safety rules. Operators will be expected to meet a general standard of care until safety rules specific to their operations are crafted over the coming year. The rules will only apply to farms where there are paid workers. Farms that only use family members — paid or unpaid — are exempt. Farmers have held numerous protest rallies and convoys. They say they weren't consulted enough and bureaucratic red tape will strangle the culture and profitability of family farms. Cabinet ministers meeting with farmers across the province have been berated and sworn. The uproar has overshadowed a seven-week fall sitting that saw Notley's government launch programs that — should they be realized over a decade from now — will fundamentally change the bedrock of Alberta's economy. Notley announced a plan for climate change reform that includes a broad-based carbon tax on everything from gasoline at the pumps to home heating and electricity. Oilsands emissions are to be capped and coal-fired plants are to be phased out. Despite nose-diving oil prices that have sent Alberta's petro-economy deep into the red, the NDP passed a budget that ramps up spending on schools, roads, and hospitals and provides more cash for core services such as health and education. The bottom line is a forecasted $6.1-billion deficit this year and a projected $47 billion in capital debt before the end of the decade. Legislature members also had to deal with the death of one of their own. PC member Manmeet Bhullar from Calgary was hit and killed in November by a semi when he stopped his car on a snowbound highway to help a driver in an overturned vehicle.